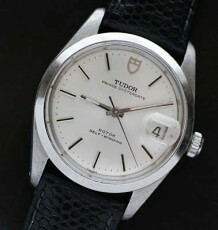 Tudor Oyster Date Prince with red/black date wheel. 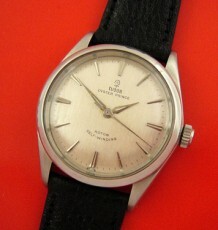 Vintage Tudor Oyster Prince Date with alternating red and black calendar disc. The watch features a solid steel case with solid gold fluted bezel and gold Oyster crown. The dial of the watch, has the much sought after small rose Tudor logo and the date wheel alternates between red and black numbers which was one of the design features Rolex used in the 1950’s and early 1960’s. 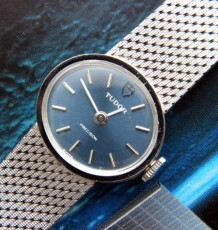 This watch, reference 7990/3, appears to date to the early 1960’s based on the ETA based movement used combined with the small rose logo and multi-coloured date disc. 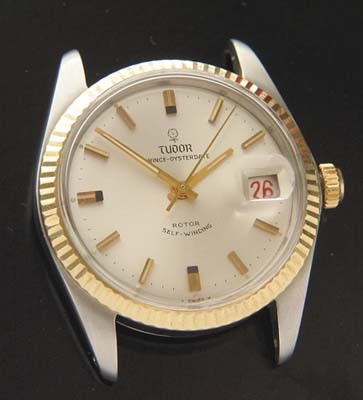 The watch has just been serviced and a brand new solid stainless steel Tudor Oyster bracelet has been purchased for the watch. Please note the original red tape still stuck under the buckle and the bracelet was installed on the watch just for these photos but remains unworn. 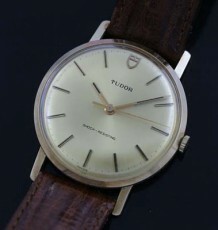 The condition of this watch is outstanding and will surely add a tremendous amount of presence to anyone’s wrist. The watch measures 34 mm wide by 41 mm long.